it is written that a dispute occurred between Molvi Ahmad Hasan Sahib Amrohi and Molvi Fakhr ul Hasan Sahib Ganghohi, and Mahmud ul Hasan Deobandi took one side and entered the dispute, and this matter remained for a long time, so: “One morning after the prayer of Fajr, Maulana Rafi’ ud Din Sahib (rah) called Maulana Mahmud ul Hasan Sahib in his room (which is in Dar ul ‘Ulum Deoband) and Maulana came…the weather was very cold. 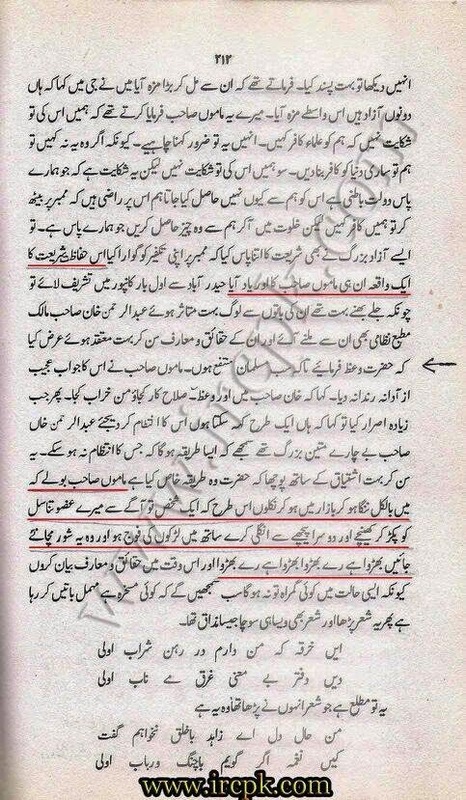 Maulana Rafi’ud Din said: first look at my condition, and Maulana looked at his condition and he was wet (because of sweating), he said: The fact is that Maulana Nanotwi (rah) came with his physical body (Jasad ‘Unsuri) which made me sweat this much…and he asked Mahmud ul Hasan not to enter this dispute, so I called you only to tell you this. Maulana Mahmud ul Hasan said: Hazrat, I make Tawbah at your hand and after this I will not talk about this issue. Just Imagine if Imam Bukhaari expressed his love for his shaykh `Ali ibn Madeeni this way? Or Imaam Ibn Baaz rahimahullah expressed it to Shaykh Albaanee? My god ! i need asprin to even imagine such Aimmah doing such an act which these Allamah faqeeh hakeem ul Ummat Mujtahid ul-Mars – Hujjat e Saturn , Wasail e Pluto mawlanas end up doing.